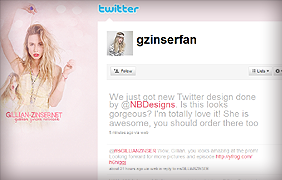 Gillian Zinser Network | Your first & most exclusive source about 90210 actress Gillian Zinser / celebrating 5 years online! Gillian Amalia Zinser is an American actress, known for her appearances as Ivy Sullivan in 90210. She attended New York University in New York City, NY. Prior to 90210, she appeared in Southland, Cold Case and Cupid. She played a recurring role in 90210 during the second season from 2009 to 2010, as a young Californian surfer named Ivy Sullivan. In February 2010, she was signed as a regular cast member for the third season of the show. In 2011 Zinser starred in her first feature, The Truth Below for MTV, and in Liars All with Matt Lanter. She grew up in Washington, D.C. and now resides in Venice, California. GillianZinser.Net is just a fansite for everything Gillian Zinser. This website is here for take some informations , her lastest news, and many pictures of Gillian for others fans. We haven't got a contact with her, her friends or her agent. Thanks to respect our work. This entry was posted on Tuesday, June 5th, 2018 at 2:16 pm and is filed under Gallery Updates. You can follow any responses to this entry through the RSS 2.0 feed. You can leave a response, or trackback from your own site.